It h appens to the best of us. You let your pet out one last time before bed. It is a beautiful night... until you hear a terrible yelp and cry, and you see this running your way. What do you do? Stay calm and get a Veterinary Hospital right away. DO NOT TRY TO REMOVE THEM YOURSELF. QUILL REMOVAL IS NOT A DIY PROJECT. Quills look smooth to the naked eye, and it can be tempting to think they'll come out easily. Many of us have thought, "He lets me clip his nails. One good tug should be all it takes. Going to the vet means a bill. An emergency vet would mean an even bigger bill. Let's just give this a try." This is a bad idea. Let us explain. Nature has designed quills with barbs, making removal both difficult and painful. 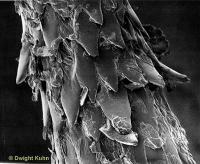 Here is a close up of what you'll be pulling past your pet's tissue. Imagine how much that will hurt coming out. Now imagine having 90 of them to remove. It isn't reasonable to expect any animal to to lerate that without medication. Trying to remove them at home, only to decide you have to bring them to the vet, causes a spike in fight or flight responses that just makes things more dangerous. There can be an increase risk of bite injury, broken or migrating quills, or a need for higher than normal levels of anesthesia. In addition to the unnecessary trauma and danger, it also makes the eventual hospital visit that much more expensive. Call us or a local emergency hospital right away. You'll thank us later! You went to the veterinary hospital, all detectible quills were removed, and you're back home. What's next? Knowing what to watch for will be important for your pet's successful recovery. The standard discharge instructions we give for quill removal are below. If we gave you instructions that differ from these, follow the specific instructions for your pet. Don't hesitate to call us if there is any chance the difference in instructions could be a misunderstanding or if you have any questions. Quill removal usually requires sedation and/or anesthesia. As a result, your pet may be sleepy or lethargic for the rest of the day. They may not be as coordinated as usual, and should be confined to areas without stairs or other dangers. Any pain medications and antibiotics prescribed should be given with food unless otherwise instructed. If your pet has a reaction to the medications, such as vomiting or diarrhea, call us as soon as possible. 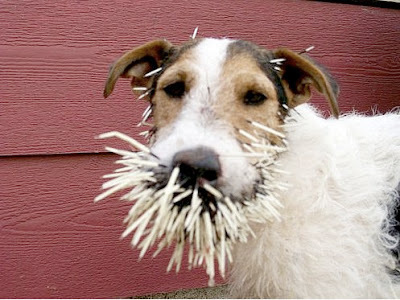 The barbs on porcupine quills allow them to migrate under the skin and through soft tissue, often before the pet arrives at the veterinarian. We removed all detectible quills, one at a time, using forceps or needle drivers. Sometimes, small incisions are required. The irritation to the tissue may cause slight swelling for the next day or two. Please discourage your pet from rubbing or licking at the area to avoid further irritation, trauma and infection. Should your pet have additional quills we could not detect, their body may form scar tissue around the quill to prevent further migration. Alternatively, quills may migrate through the skin and tissue for a period of days or months, finally emerging far from their point of entry. If you see or feel bumps, sharp points under the skin, small wounds, swelling or signs of pain or infection, please call our office to schedule a follow up visit. We will need to assess your pet’s condition in order to develop an appropriate treatment plan. If you see any of these signs, please seek treatment immediately. Thank you for trusting us with your pet’s health.